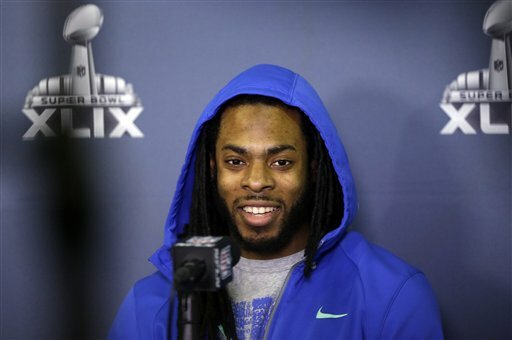 RENTON, Wash. (AP) — A wide-brimmed hat was the only extra piece of attire for Richard Sherman. No brace, not even a sleeve covering the left elbow he injured in last January’s NFC Championship game. Sherman initially believed he would need Tommy John surgery on the elbow that was injured in the fourth quarter of the NFC title game against Green Bay, but after speaking with other players and consulting with doctors he decided against the surgery for now. The main reason? The amount of time needed to recover. Sherman said he’s been rehabbing most of the four months since the Seahawks’ Super Bowl loss to New England, but he has been able to participate in the OTAs. Surgery could have sidelined him for up to nine months, Sherman said. In the Super Bowl, Sherman said he couldn’t fully extend his left arm. He was part of a secondary that was battered by the end of the game, with Sherman, safeties Earl Thomas and Kam Chancellor and cornerbacks Jeremy Lane and Tharold Simon all either playing through injuries or having suffered injuries in the game. Sherman also had a response for recent comments from New York Jets cornerback Antonio Cromartie, who criticized Sherman for only playing one side of the field. Cromartie told SiriusXM NFL Radio last week that Sherman cannot be considered the top cornerback in the NFL because he doesn’t follow the other team’s No. 1 receiver. Sherman called Cromartie’s comments “unfortunate,” then pointed out that Cromartie only made the Pro Bowl last year because the Seahawks were in the Super Bowl and Sherman had to withdraw.